It’s June 12, 2005- a day before my fifteenth birthday- and I just received a package in the mail. I already know what it is, so I tear into the black plastic like a starving raccoon. Once the wrapping is removed, I take a moment to stare in awe & reverence as though it were my first born: Grand Theft Auto: San Andreas (for XBOX). My entire summer is decided right then. I remember when the PS2 was still new & GTA III released. The first time I got some real quality time with it, my 11-year-old brain nearly erupted in a fountain of sinewy pink viscera. See, I pick up on obscure/unimportant details (like I have some deficit of attention or something) & I was sure I had games figured out. I played my PS1 CONSTANTLY, I knew that there were constraints that required some trickery to over come. Spider-Man never opened or closed his hands in the same shot of a cutscene. Solid Snake barely had a FACE, much less LIPS. They both bobbed their head when they spoke. But here was this Luigi guy mouthing the words he spoke, having a thumb & fingers. Sure, he didn’t have individual digits, but he didn’t have massive, immobile mitts shaped like a computer mouse. I was instantly obsessed with Grand Theft Auto. It seemed like a sequel came almost immediately when I saw Vice City on the cover of a gaming magazine at a local grocery store. I got my XBOX on Christmas day, 2003. The first real game I got was MGS 2. The next was the GTA 2-Pack. I hadn’t yet reached the point of becoming invested in the narrative, and I still skipped most cutscenes. All this is to say that, after I played III until I was sick of it (but before my narrative cherry was popped** by Max Payne) Vice City just didn’t grab me. Sure, I liked the soundtrack & the 80s setting. But I couldn’t care less about the rest. I didn’t like the city or the weird blur effect, didn’t know who Ray Liotta was, and wasn’t at the point of caring about the story. But eventually, magazines like EGM & OPM started covering the next game in the series. One that felt like it was tailor made for me. Mid-90s, West Coast, Boyz N The Hood type story? Sign me up! Then details trickled in... RPG like stats! Customizable character! WAY bigger city! “If you don’t eat after a few days, you’ll die!” Oh no! That sounds terrible! Wow, look at the map! Wow, basketball! Wow, wow, wow! Then the reviews came as the game launched on PS2. But what of an XBOX version? Don’t tell me I have to miss this new, awesome GTA *AND* the new Metal Gear! But the reviews are so good! “Why does the industry hate XBOX? It’s obviously a better console! Even GameCube is better than PS2!” Ahhh... Being a fanboy even though I couldn’t afford another console if I wanted one. Good times. Sorry, you probably don’t need all that context. But there it is. Teenage me through 2004 (minus the unbelievable obsession I had with Fable throughout the Winter). Let’s get to the game in question. The GTA I awaited with baited breath. I remember loading it into my XBOX. As the green plasma bounced around deep inside the “X”, my heart pounded in my chest with about as much intensity- nearly bursting an XBOX logo out of my sternum. The dashboard came up, and I almost scrolled to “Music” to play something and calm down. Here I was. Sitting with a VERY anticipated game, a BRAND NEW game even. Near my birthday!! Who was I to be so lucky?? No time to care, I pressed play. 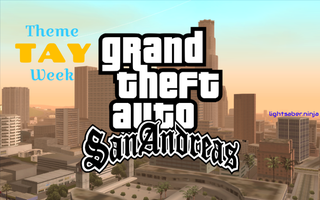 After watching the Rockstar logos appear over a 90s-era, West Coast Hip-Hop beat, the game starts. I was hooked in right from the opening line. You can hear it in CJ’s voice, “I escaped this life. Now Grove Street is dragging me back.” His mother was killed, and he’s come back to Los Santos to assist/console his siblings (older brother Sweet, & younger sister Kendl). After I played the first Max Payne, I started paying more attention to the narrative in games. You know the way that Comic fans talk about how great some stories are, despite the ridiculousness found in the medium? That’s how I feel about the story in games. And San Andreas sunk it’s teeth into me. So CJ leaves the Airport, and he gets into a cab to heads for his childhood home, but is quickly pulled over by a crooked cop. Officer Tenpenny puts CJ in his ride, and I was struck by 2 things: Tenpenny is Samuel L Jackson. His partner is Michael Rappaport. Awesome. Tenpenny threatens CJ that unless he cooperates, he’ll be facing a charge of killing a cop (a cop Tenpenny killed). With his hands tied, CJ reluctantly accepts and Tenpenny drops him off. “See you around CJ. Like a doughnut!” Tenpenny retorts before driving off. That’s when the game begins. To me, in 2005, the game looked like this. Your first objective is to grab a bike and go to Grove Street, but at this point Low Santos is opened. I chose to make my way home and see what else happened. The graphics blew me away. Card had reflections, streets had cracks, hands could open and close... It was awesome. Story wise, you meet all the important members of Grove Street Families - Sweet, Ryder, & Big Smoke. Sweet ends up becoming a damsel in distress, Ryder is a great GTA type character, and Big Smoke is a Marijuana Philosopher whose shtick is that he’s fat. The opening hours of the game serve to teach the basics. You learn to drive, shoot, and both. You buy clothes, learn about gyms, clubs, food, and other things. It’s also early on that the worst, most infamous mission takes place. Oddly enough, I loved this mission the first time. It went very smooth, perfect even. But that seems to happen in every GTA game for me. My first time is smooth, and every subsequent play through is the WORST. So while I didn’t understand the hate at first, I quickly learned in every play after. San Andreas WAS my summer that year, and I loved every second of it. All the celebrity voices that popped up, the licensed songs, flying, jetpacks, all the activities, the colorful characters, the controls, tagging, dancing, drive-bys, turf wars, all of it. It was also Rockstar’s first attempt at relationships (which led to the Hot Coffee Scandal & my first political opinions, but that’s another story). All in all, it was my favorite GTA game ever. As much as I loved IV, it wasn’t what I wanted. For a long time the closest I ever got to San Andreas 2 was the first Saint’s Row game. San Andreas was a masterpiece, my favorite summer as a gamer. I will forever look back on my time playing with a particular fondness.